The other night I invited to the Radio Times Covers Party in the ballroom at Claridges. What is a Covers Party, you ask? Well, anyone who has been on the cover of the Radio Times in the past year is invited and is given a special framed copy of that week’s magazine. Obviously, with at least 52 celebrities invited (although they don’t all turn up) it’s a kind of celebrity zoo. I believe I was invited as a kind of runner-up rejected cover. 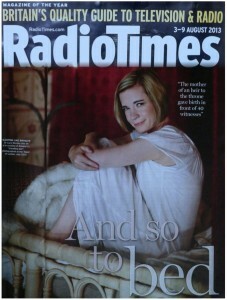 Last summer I had my picture taken for the Radio Times. I was told not to tell anyone (oops, just blown that), but that the shoot would be considered for the cover. Anyway, it was rejected. But I don’t care, because HEY that picture appeared on the Whitchurch Village Website (news, 1st August, 2013), which is obviously far better. When I got my invitation, I told a wise friend that I wasn’t going to the party because it sounded like a living hell. However, she said that I should definitely go, and that a celebrity zoo is almost as much fun as the real kind. And indeed it was, and I ended up being quite pleased that I took the plunge. Quite early on Graham Norton (who was the host) said that any celebrities in the room who were NOT covers should be embarrassed to be there and should sack their teams. I didn’t know quite what to do, because I did not want to self-identify as a celebrity (that would have been grandiose) by instantly sacking Iain, the publicist involved in my Radio Times adventure (I was standing next to him). At the same time, obviously, he should have sold his mother or something to get me on, and that was clearly a moral failing for which he should pay. Trapped in my dilemma, I eventually achieved equilibrium once again by looking at the floor and shuffling my feet a bit. But then things picked up with the appearance of the actual celebrities. You will want to know what celebrities I saw. I saw Brian Cox and Grayson Perry and Gareth Malone and Mary Berry and Nicolas Parsons and a Hairy Biker. And Amanda Holden. All of a sudden, Bettany and I were tapped on the shoulder and summoned into the special celebrity room! In this special room(!) at the back, all the celebrities(!) were lining up to have their pictures taken. Bettany and I were in fact queue-jumped at this point by Carson the Butler. ‘Did I push in, ladies?’ he asked. ‘Well that’s just the kind of person I am’. Before you all send me emails saying ‘how rude’, let me tell you that he said it a very funny way. And you may scoff as much as you like, but I was genuinely rather thrilled to have Carson the Butler pushing into a queue in front of me. We also saw Olivia Colman, whom I very much admire. When I saw that she couldn’t walk in her heels, she endeared herself to me even more. Carson and Colman really topped off the evening for me. There were now so many celebrities all over the place that I didn’t even know who they all were. Satiated with fame, your celebrity correspondent went home, and had a nice cup of tea. * Okay, I realise I can’t just leave it at that. What happened was that he was feeding the baby with a bottle, but he didn’t realise it had actual breast milk in it. I’ve been to several celebrity bashes, and I always feel a bit of a fraud because I’m not one and I don’t recognise many these days who are. It was easier when we only had four TV channels and people still went to the flicks regularly, because celebs were much thinner on the ground. So glad to know that you and Bettany Hughes are both nice, normal ladies-and not to mention- friends! What style, really enjoy the way you tell these tales. Should have been a cover – it’s a lovely picture! Neither you nor Bettany are celebrities, because you are both well known for your achievements rather than just for being famous. “Celebrity” is definitely a derogatory term, Lucy. You are a Good Presenter. Sadly I have not heard of half of those you listed..
you be on our TV screens again ? 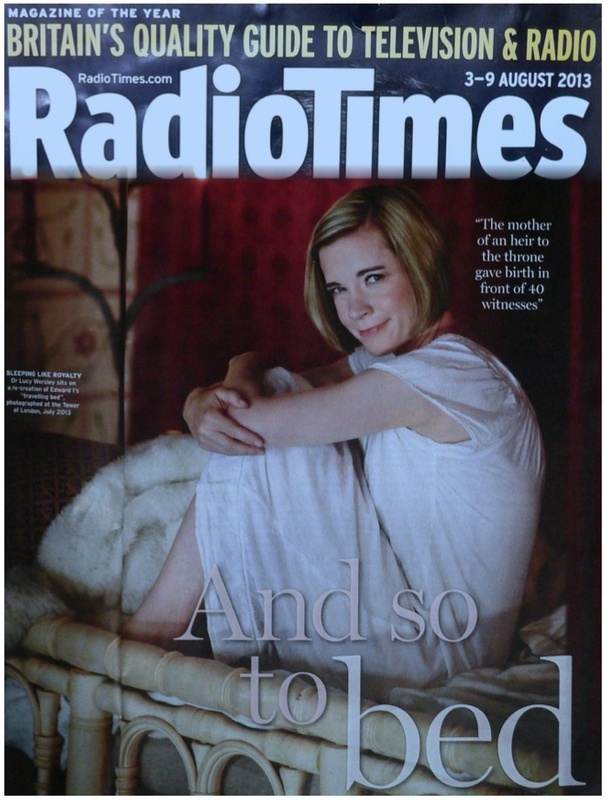 It’s too bad you didn’t get on the cover of RadioTimes. It would have suited your perfectly, being that the radio is sort of a historical object at this point. I realized I made a spelling error. Please ignore, everyone. Meh, I was invited but decided that I will not grace them with my glorious presence.